An effective way to level up your character is farming Dolmans (Dark Anchors). So, this is how it is done. First you pick three Dolmans in one province like Auridon for instance. 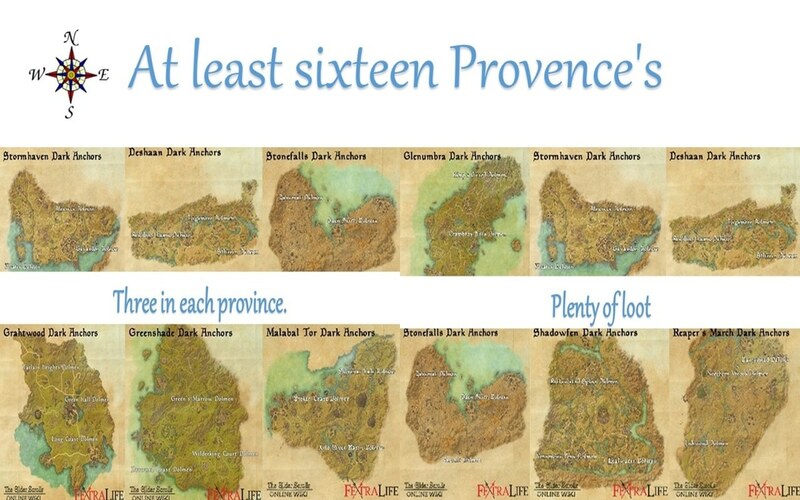 There are at least sixteen provinces across Tamriel that have three Dolmans in them (Ten in Cyrodiil). However not all Dolmans are easy to get to, so you need to pick the right ones, preferably Dolmans that are close to Way-Shrines for easy teleporting from one to the other. This way you don’t need to wait the ten minutes for the Dolman to re-spawn, you simply go to the next one in the area, tackle that one and move on to the next. By the time you have done two, the first one you did have re-spawned and is ready to farm again. This is called a Dolman or Dark Anchor circuit and you can keep doing this for ages. 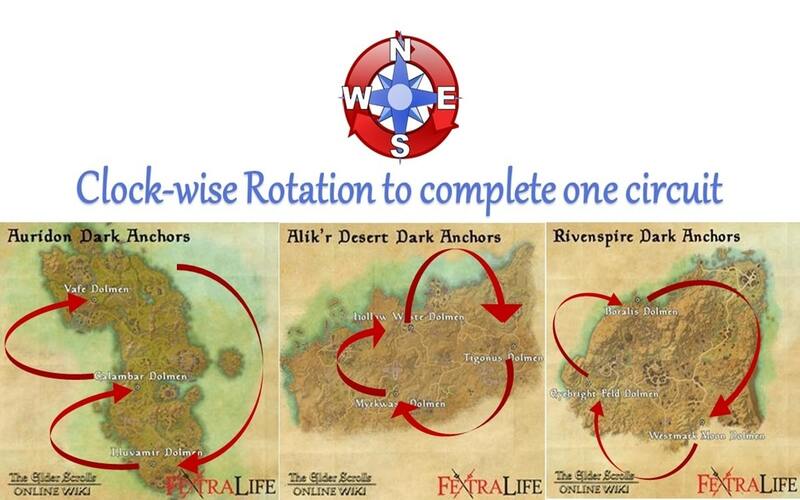 The Alik’r Desert Triangle is another favorite circuit that guarantees 100% Dolmen uptime, oh and by the way you get awesome drops from the Dolmans in Cyrodiil, but that’s another story. Anyway, as your character levels up, so too does the level of jewelry and armor you get so you can use it as well as sell it. It’s pretty much just non- stop Dolmen power levelling, Dolmen after Dolmen. If you have troubles finding the rotation, just look for the zerg of players going to and from way-shrines to dolmens and join them. The diagram below should help you get the idea. Some Dolmans are easier to get to than others and, so they become very popular to farm. This ease of access means that it can become a little crowded and reduces your chance of getting the full advantage from the drops. However, by changing the province or zone after a few circuits you get variety and you will get different drops of jewelry and other loot. You can type “LFG” in your chat box and link up with other players doing the same. Soon you will be getting loot, making gold, leveling up, making friends and having fun with a bunch of guys and gals all with the same goals. In other words, it doesn’t have to be boring and it is a wonderful time to recruit people into our guild. Remember, relationships from shared experiences should always come first, then new guild members will naturally follow without you having any phoniness or pressure. Your inventory will quickly fill, and you will have to visit the bank and merchants to sell and store your stuff. Dolman farming goes on all day every day and don’t think that just because a character is low that the owner is a newb. It is good practice to be well mannered whatever you are doing and don’t be intimidated by other experienced players. The good ones are usually kind, generous and helpful. If you meet someone who is not, just ignore them, you have just as much right to do the Dolmans as anyone. There are over 10 million players of this game so eventually you will meet and make lots of friends. I have ten veteran characters and still use the Dolman farming method to level up my (Toons) characters. Below are some of the locations of Dark Anchors or Dolmans. It is fun rushing to the way-shrines and seeing if you can beat your friends to the next Dolman. I craft my armor with a training trait to take full advantage of that and I use Cowards gear so that I can run to the way-shrines as fast as some other players can ride, but that’s just me. Of course, you need shards as well so every now and then I take a break from the bedlam of Dolman farming and do a delve or two to get my shards. Depending on how you are getting on with the group that you are in, you can also take a break from Dolman destroying and go stomp on bosses nearby. Savage Hearts does an official Whack a Boss Run also, more on this in another article. Another good Dolman 100% circuit is in Rivernspire. It is not as popular as the others, but you have more of a chance to get a hit in if the other areas become too crowded, plus there is a giant spider that the zergs like to clobber on the way from the Dolman to the way-shrine and you still have time to make it to the next Dolman. You get different drops from each area. While you are waiting for a re-spawn you can trade with other players who are waiting as well and in this way, you always have something to do. Some circuits are slower than others, but the drops can be worth the wait especially if you have some friends with you to talk to. Therefore having Discord live chat software can be a great advantage. Some players use the waiting time to practice emotes and musical instrument playing. I have been in groups of twenty or more who have all burst out into random dancing. A dance party can be an effective way to pass the time away, if that is your thing. I think it’s all about having fun and if you ever feel angry or frustrated then it is time to have a break from the game, don’t you think? 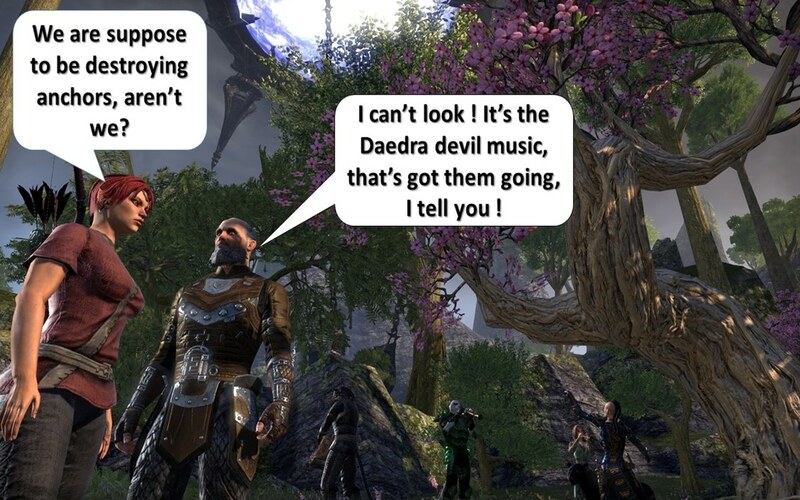 Just as the Mages guild main quest gives you rapid lore book learning the fighter’s guild gives you a Daedric fighting advantage. This also is a fantastic way to learn where the Dolmans are and how to get to them. Each Daedric Anchor that your character destroys is rewarded with an XP bonus to the Fighters Guild skill line so be sure to get the Fighters guild skill line as soon as you can. This in turn, opens valuable new Fighters Guild abilities for you to invest skill points in to be able to better fight Daedra and the undead. You will also get exploration XP for the first time you do a Dolmen and it gets filled in on your map as you begin. You will also get XP for killing the spawning mobs. Besides, enemy loot drops from the first wave of cultists and from more power foes after the fourth pinion is defeated, participating players can also win achievements and random cosmetic armor and weapons. Rewards for destroying Dark Anchors are to be distributed evenly amongst active participants. However, it is possible that players still might not receive loot or experience if the anchor and enemies are more than five levels below their own. Even so, chest drops are to the right of the middle stairs upon defeating the fifth anchor pinion (and final boss to destroy the Daedric Dolmen), and each player actively participating in the battle to destroy the Daedric Dolmen are each supposed to be able to get something from the chest now. Each time you battle and defeat a Daedric Dolmen, it will check that one off in your journal, to add towards achievements too. You can look in your in-game Journal, and then go to the Achievements tab, then to the Dark Anchors tab to see all the many possible achievement awards and your own progress towards them. 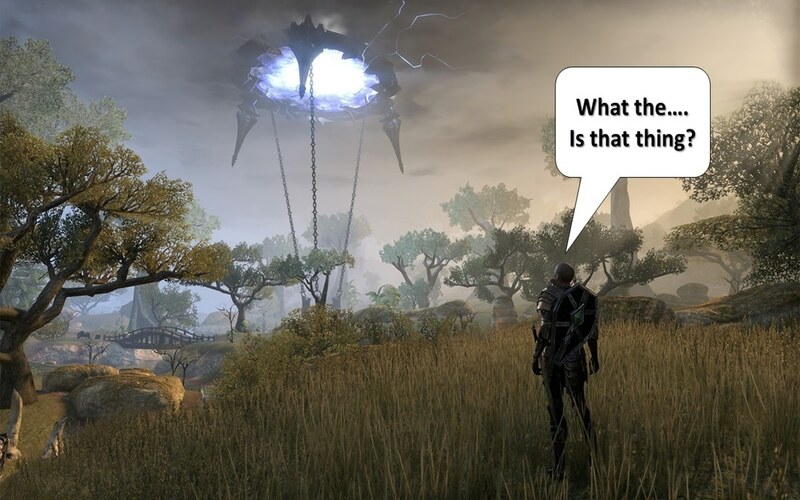 There are also special Daedric Dolmen achievements for fighting some of the unique Daedra that may appear, and the Daedric Lord Slayer Achievement for defeating all sixteen of the Generals of Molag Bal; including the Son of Molag Bal. So, this is how it is done and I hope you have fun doing it. There are plenty of other articles on all sorts of things to do with Savage Hearts ESO, so happy reading and I’ll see you in Tamriel.